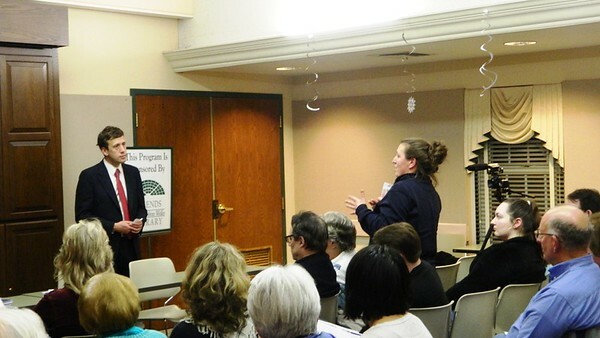 NEWINGTON - A snowstorm didn’t keep residents from a recent opportunity to probe legislators on everything from health care to transportation. 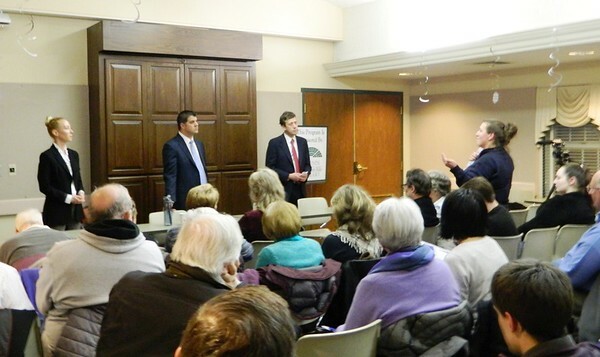 State Sen. Matt Lesser of the 9th District joined state Reps. Gary Turco of the 27th District and Kerry Wood of the 29th District at the Lucy Robbins Welles Library for their first Community Forum on Jan. 29. 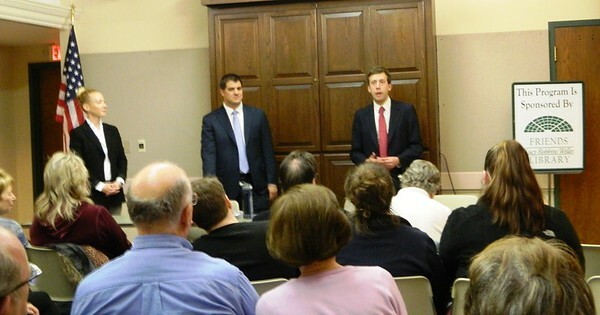 Newington’s new legislative contingent was pleasantly surprised to face a packed room, despite stormy weather. The three distributed note cards at the start of the program. Dozens of questions and comments were collected, and all were read aloud. “What can legislators do to solve the underlying problem causing high health care costs?” Lesser read. “How come I get all the hard questions?” joked the senator, who is known for his light-hearted sense of humor. 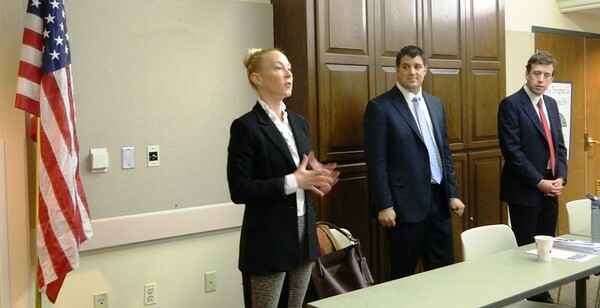 Then he took a serious tone, proposing that every Connecticut resident have the option to sign up for the same health care plan available to legislators. “If we do tackle health care in a meaningful way. I think we can make the state more business-friendly,” Lesser said. Another attendee asked the legislators to name one proposal to cut state spending. Wood went on to explain House Bill 6990, An Act Concerning Incentives to State Employees for Budget Savings. “I proposed a bill to empower state employees to find net savings. They know how their agencies are run, inside and out. Who better to identify areas of wasteful spending?” she said. A one-time bonus would be offered to employees who accurately identify savings. People with their own suggestions for spending cuts shot their hands up. “By cutting so many state employees, you’re necessitating overtime,” Dave Marsden said. Dana Havens said she has seen that CTfastrak buses are crowded at rush hours but have very light ridership at other times. “Instead of a bus every five minutes during these slower times, why not every 15 minutes?” Havens proposed. One contributor inquired about a rumor he had heard that legislators are reimbursed for their mileage. “I believe it’s 53 cents a mile from home to the Capitol, but no reimbursement to and from any other locations,” Turco responded, adding that his daily return was less than $5 and the legislative starting salary of $28,000 hasn’t risen in 20 years. Other ideas bounced around were regionalization of school districts, incentives for “green” living and ways to reduce utility costs. Groans were heard when the issue of the Metropolitan District Commission’s annual rate hikes came up. The average Newington resident faces a $7 increase to their bill this year, due in part to the Clean Water Project and replacement of aging water and sewer infrastructure. Before the gathering dissolved and people dared the snowy drive home, legislators made an urgent plea. “We’re open to questions and comments anytime, all the time,” Wood pointed out. “People who have never talked to us have no right to complain about us,” Lesser added. Posted in New Britain Herald, Newington on Wednesday, 6 February 2019 20:32. Updated: Wednesday, 6 February 2019 20:35.